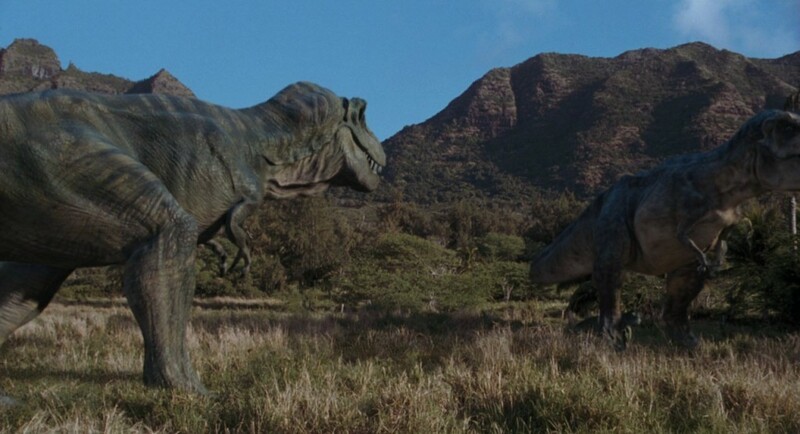 This Tyrannosaurus male was encountered by both InGen teams on Isla Sorna in 1997 and was the individual that hunter Roland Tembo sought to hunt during his trip to Isla Sorna while accompanying the InGen Harvest team. 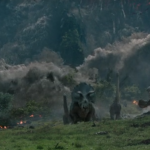 This T. rex was later tranquilized by Roland and taken to San Diego where the animal escaped and rampaged before he was able to be rounded up and brought back to Isla Sorna. This male was fifteen to sixteen feet at the hip, and forty feet long from premaxilla to the tip of the caudals. The face of the bull was covered with several facial scars and some of the teeth in his mouth were broken or missing. This was indicative of fighting for mating rights or dominance. Besides being possibly smaller given paleontology research at the time it was encountered (meta: 1997 was when the film was made and paleontology at the time suggested males were smaller than female Tyrannosaurs) and having a different color pattern, the buck was distinguished from the female with a more ornamented face, which had more solid features than the female. The exact age of this male is unknown, but he was of breeding age and was fully matured as evidenced by coloration, sub-adult males having a lighter variation of color pattern. The first instance the Buck was mentioned was by Roland Tembo when he told Peter Ludlow that the only reason for his inclusion on Ludlow’s trip was his being allowed to hunt the male Tyrannosaurus. 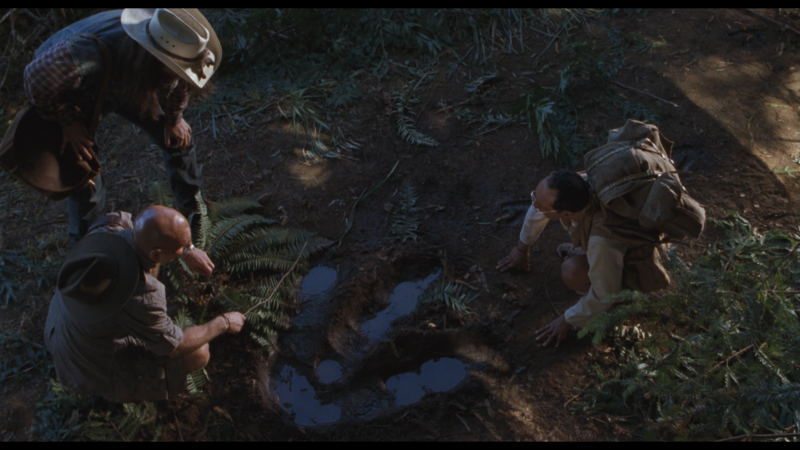 Later Roland and his best friend, Ajay Sidhu, found the T. rex nest in hopes of finding the buck. Only finding the infant Tyrannosaurus that the bull and his mate had left behind to feed on a carcass while away for a short while, Roland then devised a plan to lure the buck by kidnapping the infant Tyrannosaurus. However, Roland’s plan was never fulfilled. In a drunken stupor, Ludlow went to converse with Roland at his trap, but tripped and fell onto the infant T. rex, breaking the infant’s leg. 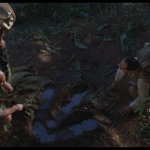 When Nick Van Owen and Dr. Sarah Harding sneaked into the InGen Encampment to sabotage the equipment, Nick found the injured baby T. rex and brought him to the Mobile Lab trailers with Dr. Harding where they set a cast around the broken leg. However, in their plan, they had failed to realize that the parents would follow the scent of their infant. 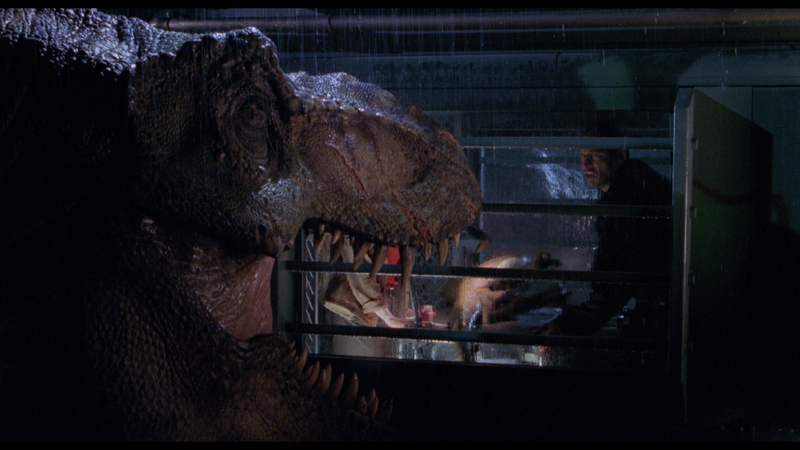 The parent T. rex came up on the trailer end, where they found their infant. There, Dr. Harding returned the still partially tranquilized infant to the male. The bull and his mate found a place to hide their infant then returned to the trailers. Turning the back half of the accordion vehicle upside down, the two T. rex then managed in shattering the front windshield and pushing the back half over the cliff the trailers are parked at the edge of before leaving, apparently satisfied with their work. 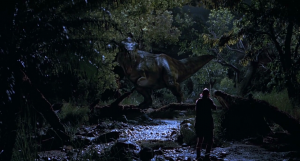 However, they once again returned when Eddie Carr, who had came to the rescue of his friends, was caught by the T. rex pair attempting to pull the the trailers back over the cliff in his own vehicle. 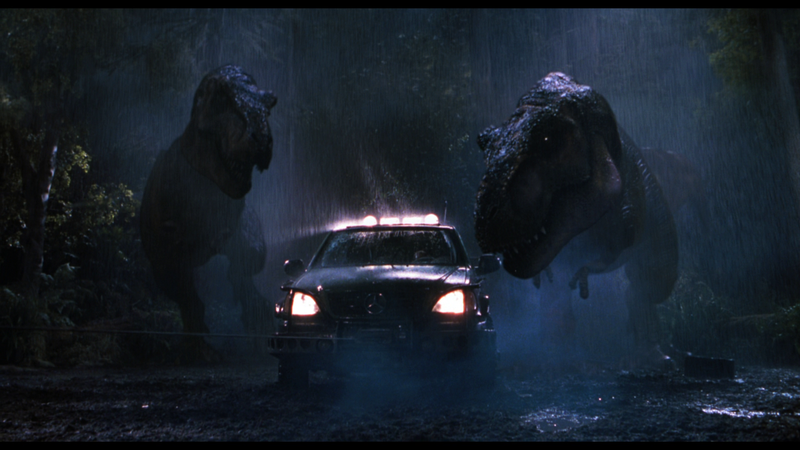 The T. rex pair, hearing the loud noise that Eddie’s Mercedes SUV was making, returned to the site. Finding the vehicle, the Buck bit off the roof to the SUV and then attempted to get to Eddie. While grabbing for his Lindstradt Air rifle, Eddie was grabbed by the bull T. rex, who was joined by his mate in ripping the man in two at the waist. 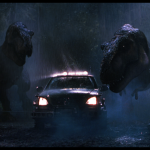 Finally satisfied with their work, the two T. rex left and the trailer inhabitants were rescued by the InGen team. 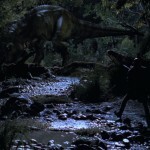 The Tyrannosaurus were not seen again until they found their way to the survivor’s final encampment. The buck, following the scent of the his infant’s blood now stained to the shirt of Dr. Sarah Harding, poked his head into Dr. Harding’s tent. 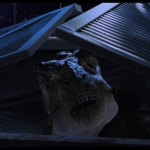 Sniffing around and cuing in on the shirt hanging from a line stretched across the tent interior, the T. rex was startled when Carter woke up and screamed at his presence. Lifting the tent from the ground, and momentarily blinded, the buck was able to remove the tent from his face by shaking it off. His mate arriving on the scene, scared the hunters into a tight ravine where the female pursued them, leaving the buck behind to scavenge through any remains. 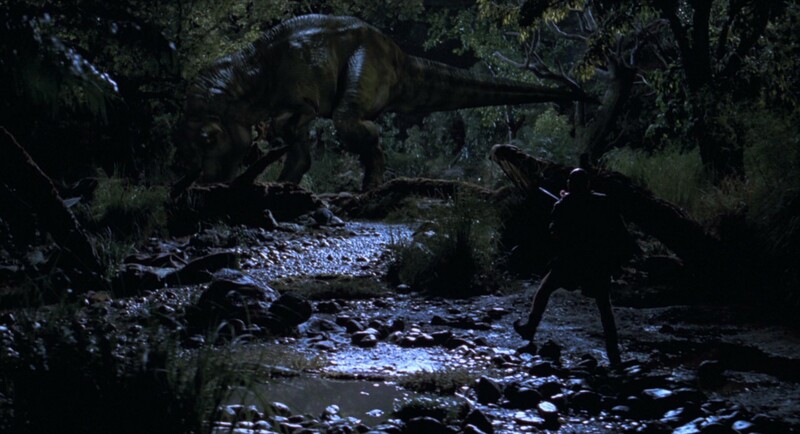 While doing so, Roland took the chance to shoot the T. rex with his double barreled rifle, only to find that Nick Van Owen had sabotaged his weapon. He then proceeded to shoot the Buck with an over dosage of concentrated carfentanil. Unfortunately for Roland, Ludlow came across the still alive T. rex and ordered the sedated animal to be secured for transport to San Diego where Ludlow hoped to display the animal, along with his infant, in Jurassic Park: San Diego being refurbished there to replace the Park at the now destroyed Isla Nublar. Unfortunately, sometime during the trip, the T. rex stopped breathing and entered a comatose state. In an effort to save the animal, he was administered naltrexone to counter the large dosage of carfentanil given to him when Roland shot him. 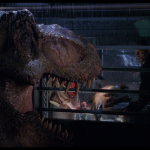 The T. rex, now in a berserk state, broke out of his containment unit and attacked those serving on board the S.S. Venture. 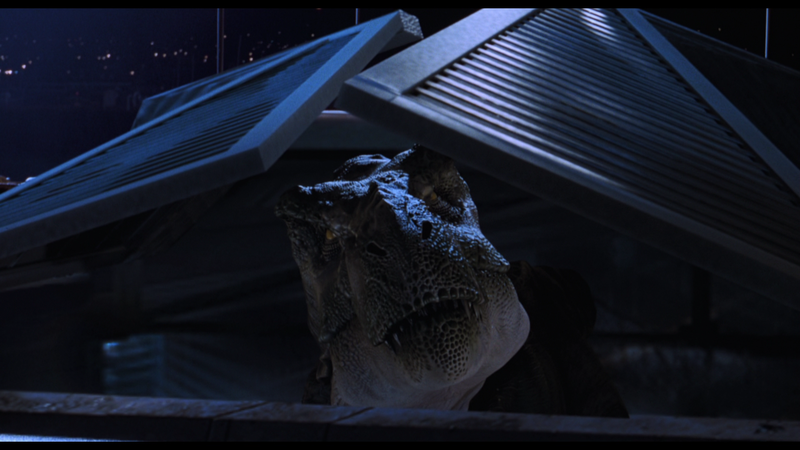 Somehow the T. rex was lured into the cargo hold, where he stayed until Ludlow foolishly ordered the area checked once the ship docked at the InGen Docks at San Diego. The T. rex, now free, broke through the dock check point and wandered into San Diego. Dr. Sarah Harding and Dr. Ian Malcolm then devised a plan to lure the raging animal back to the ship by using the infant to bring him. 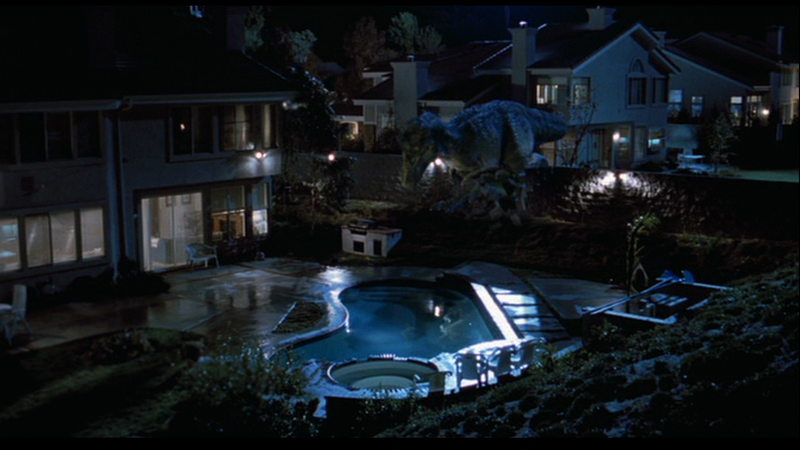 While they went to the San Diego: Jurassic Park to retrieve the infant, the male T. rex wandered into a neighborhood. Finding a house with a backyard pool, the animal broke through the brick wall lining the yard and into the pool area where he began drinking. The family dog, not phased by the intrusion, began to bark at the much larger predator only to be quickly silenced by a growl from the beast. The noise awoke Benjamin, a child, who then dragged his parents into his bedroom to show them the dinosaur. When they arrived, they found that their dog had been eaten by the T. rex, who growled at the family before returning to the city. Rampaging through downtown, the Tyrannosaurus scared everyone he encountered. The T. rex tested his surroundings in various ways including biting traffic lights and smashing a bus into a Blockbuster Video store. Dr. Malcolm and Dr. Harding, who had recovered the infant by this time, came upon the scene and then led the T. rex back to the docks. Returning the animal to the ship, Dr. Malcolm and Dr. Harding found that Ludlow, who had given the police orders to kill the bull and leave the infant alive, had followed them in an effort to recover the infant T. rex. Hearing the infant’s call from the cargo hold of the ship, Ludlow entered only to, unbeknownst to Ludlow, be followed in by the adult male. Attempting to capture the growling infant bare handed, Ludlow realized only too late that he had been trapped. Attempting to scurry up the stairs back up to the main deck, Ludlow was grabbed in the male’s jaws, who brought Ludlow back to the cargo hold floor where he dropped him. Attempting to stand back up, the male T. rex pushed Ludlow back to the floor where he proudly watched his son pounce the hapless executive. However, this victory was short lived as police helicopters surrounded the gaping cargo hold doors. Their guns aimed to fire, they were foiled in their attempt to kill the tyrant lizard king by Malcolm–who was able to get the doors closed–and Harding who tranquilized him. 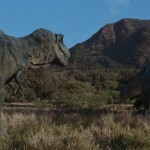 The pair of rexes were then shipped back to Isla Sorna where they were spotted with the male’s mate.